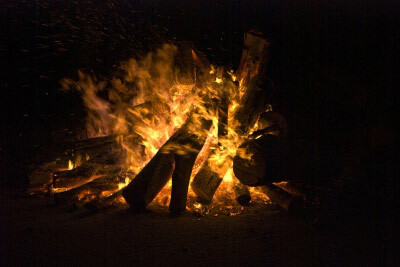 A campfire is a fun way to end an adventurous day. – Spray a muffin tin with cooking spray OR rub the inside of each muffin cup with butter. Crack one egg into each cup. Top with cheese, meat, or vegetables. Put the muffin tin on a grate above the campfire. Bake until the eggs are set (about 10 to 15 minutes). You can also make toast to go with these awesome eggs. Just lay a piece of bread on the grate next to the muffin tin. After one minute, flip the bread. Keep flipping until your toast is just the way you like it! The Private First Class Field Dinner is ready to put on the fire. 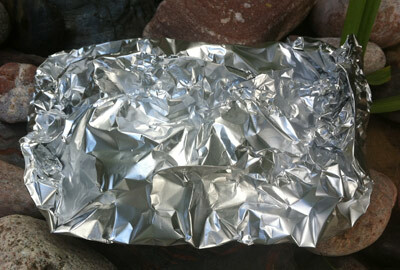 Cut a 12 inch section of tin foil and spray one side with cooking spray. Place about a handful of potatoes, a ½ handful of onions, and a ½ handful of shredded carrots. If you want to, you can add another handful of any type of vegetable you’d like. Some of our favorites are mushrooms and sweet potatoes. (Yes Sweet Potatoes!) Season the vegetables with salt, pepper, and a little garlic (Or use seasoned salt.) Top with a tablespoon of butter. Place your First Class Field Dinner on a grate over the campfire or place it in an empty coffee can in the embers. Cook it for 30 to 60 minutes or until the meat is cooked and the vegetables are tender. To see if your dinner is ready, carefully remove your tinfoil pouch from the fire using tongs or spatulas. VERY carefully open the sealed tinfoil using a fork so that you can allow the steam to escape without burning your fingers. Test the softness of the potatoes and carrots. When they are nice and soft, you’re ready to dig in! Serve with ketchup for the ultimate Private First Class experience! After a dinner like the one above, it’s time for some real army kids dessert! How about some peach grenades? They sure beat canned peach rations any day! Cut each peach in half and remove the pit. Place a marshmallow in the spot where the pit was on one half and leave the other half alone. Sprinkle both halves with sugar and cinnamon. Put the peach back together and bake it until the peach is softened. About 25 minutes. Test it by poking a toothpick into it. You can do the same thing to apples, but instead of putting a marshmallow in the middle, put a couple of caramels instead. YUM!!! JM Cremps has plenty of army gear (link) for kids to make cooking in the field a lot easier. For example, our 6-in-1 Chowset Tool is the perfect cooking companion. It’s got a knife for cutting up vegetables and meat, a fork & spoon for eating, and extra tools for cooking. Our Carabiner Mug (link) is easy to carry and clips on to your backpack or belt. It’s perfect for both hot and cold drinks. So bring on the hot chocolate! Serious campers and soldiers who spend a lot of time in the field prefer to carry a lightweight, portable meal kit in their pack. Our Outdoor Meal Kit is that and more. 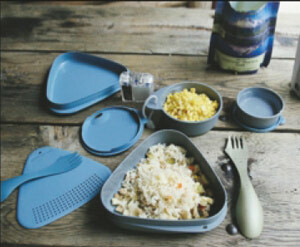 It has two plates (one that doubles as a bowl), a spill-free cup, a colander/cutting board, a fork/spoon combo, and a small waterproof box. You can’t go wrong with this one! The Outdoor Meal Kit is perfect for dinner in the field! NEVER start a fire without adult supervision. NO running or horseplay around the fire. Make sure you use the proper cooking utensils so you don’t cut or burn yourself. DO have a bucket of water near the fire incase embers or ashes get out of control.